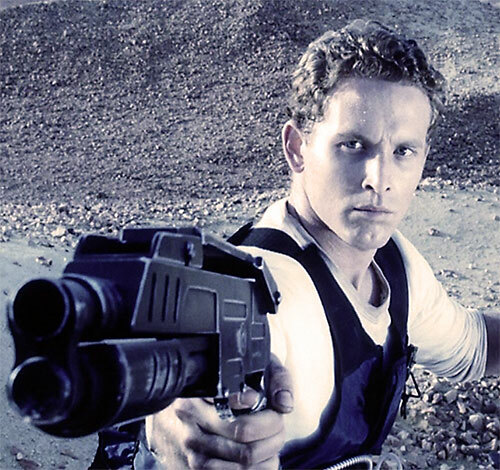 Johns was one of the main characters in 2000 sci-fi movie Pitch Black. He’s a corrupt cop/bounty hunter. For more context you can read the Riddick character profile first. Real Name: William J. Johns. Group Affiliation: United Systems Marshalls (USM). William Johns is a veteran law enforcement agent. He has extensive training and experience as a military police officer and as a marshal. In both capacities, Johns specialized in tracking AWOL soldiers. His weapon of choice is a pistol grip 12-gauge shotgun with a five-round clip. Howbeit, he’s adept with other firearms and melee weapons as well. Johns does suffer from morphine addiction, but he always keeps enough on him to keep from going into withdrawal. While Johns is a top cop and a very tough and dangerous fighter compared to the average policeman, soldier or thug, he’s not the legendary badass that he thinks he is. Riddick was correct in referring to Johns as a wanna-be. And Johns’s overestimation of his talents is the thing that most often gets him in trouble. On the other hand, Johns does have a true talent for manipulative cunning. And he is smart enough and unscrupulous enough to use that to his maximum advantage. 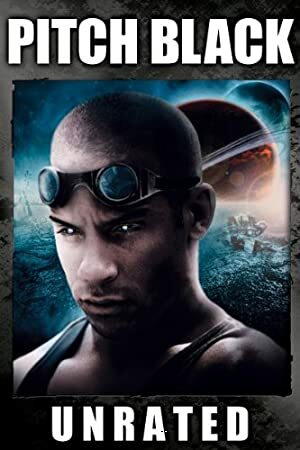 The background for the original movie listed Ursa Luna as Riddick’s last prison before Pitch Black, but the Xbox game and the background material on the director’s cut DVD list Butcher Bay as Riddick’s last prison. Since the incidents connected to Ursa Luna are still alluded to in the movie, I’ve kept the Ursa Luna material but moved it back in the chronology to take place prior to Butcher Bay. William Johns began his career as a military policeman in the United Systems Marine Corps. He quickly distinguished himself by tracking down deserters during the Wailing Wars. One of these deserters was a mercenary named Riddick, who had killed most of his own unit. Johns brought Riddick down, but not before suffering a serious stab wound to the back that left a permanent scar. The doctors had to leave a piece of the shiv in. Johns claims to feel it still pressing against his spinal cord. Riddick was convicted and sentenced to life imprisonment at the Ursa Luna Maximum-Security Orbital Prison (a.k.a. “Slam City”). Riddick eventually escaped, stowing aboard a transport and killing the pilot. 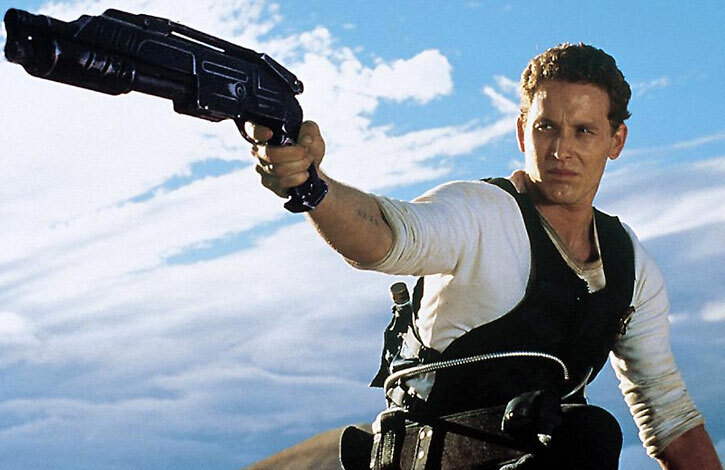 By the time of Riddick’s escape, Johns had left the military and become a United Systems Marshall. As such, he was carrying out court orders for a monetary commission. Johns specialized in the same work he did for the military, hunting down fugitives. His record was impeccable; out of 17 assignments, he had made 17 captures, despite the fact that he was working alone and chasing high-risk felons. Johns tracked Riddick down yet again and captured him. This time Johns delivered Riddick to Butcher Bay, a supposedly inescapable triple max prison. Riddick came close to escaping Butcher Bay only to be intercepted by Johns. The Marshall planned to help Riddick get out of the prison and then take him to another penal colony and collect on Riddick’s bounty a second time. Hoxie, the prison’s warden, caught Johns and Riddick and tossed them both in the slam. Johns and Riddick ran into each other while making separate escape attempts. They ended up leaving Butcher Bay together in Hoxie’s ship. Three days out of Butcher Bay, Riddick “dosed” Johns (likely meaning he overdosed Johns on Johns’s own morphine) and left him for dead. Johns survived and gave chase. He caught up to Riddick two times. But both times Riddick escaped, leaving an injured Johns behind. The third time was the charm. Riddick was slowed down trying to help some children in danger. Johns took advantage of that weakness to finally recapture Riddick. Johns got himself and Riddick a ticket on the next flight to the Tangiers system, whose prison was currently offering the highest bounty for Riddick. Johns’s and Riddick’s trip was interrupted when their transport, the Hunter-Gratzner, was damaged by a meteor shower and forced to land on a planet in the M-344/G system. There, Johns and Riddick grudgingly worked together with the other survivors of the crash. They toiled to fend off the nocturnal creatures stalking them while finding a way to escape the planet. This truce came to an abrupt end when Johns suggested killing a girl among the survivors and using her body as bait to distract the predators hunting them. Riddick liked the idea, but thought Johns was a better choice for bait. The two fought until Riddick repeated history by slashing Johns’s back. Johns stumbled out of the well-lit area that repelled the nocturnal predators and was attacked by them. He recovered his shotgun, but inadvertently reloaded it with one of the fake shells that held his morphine. Johns jacked the fake shell out of the gun, but he was fatally wounded by one of the predators before he could bring his gun to bear. Johns is a handsome White male with short, curly hair and a cleft chin. He usually has a jovial expression unless he’s tracking a target, in which case he has a look of pure concentration. Though he is 37 years old chronologically, Johns is only 29 physically. This disparity was caused by his time in cryosleep during travel between systems. He usually takes the long route to save money. He has a 3” knife scar on his back near his spine as a result of his first clash with Riddick. Johns doesn’t have any needle tracks to expose his addiction. He avoids these by shooting up through his tear ducts. Johns has his golden badge prominently shown at all times. 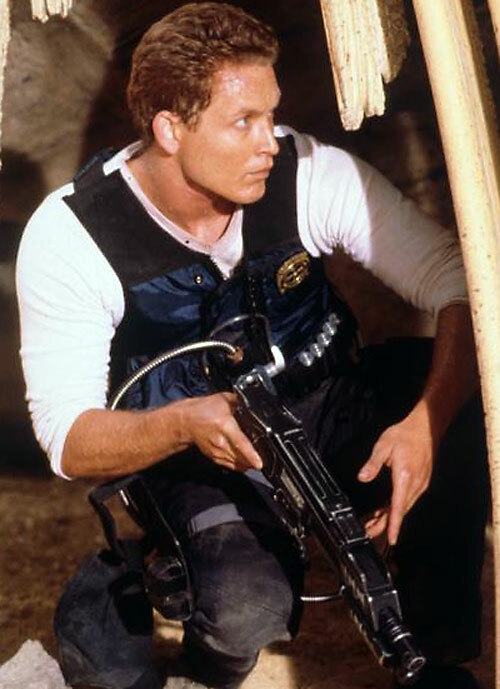 His usual attire is a pair of black pants and a dark blue long sleeve shirt with USM patches sewn on the upper sleeves, his badge displayed over his left breast pocket, and a light blue flak jacket and white t-shirt worn underneath. He sometimes wears a dark blue cap with a USM patch as well. On the surface, Johns is a right-thinking, trustworthy individual. He looks and acts every bit the “tough but fair” cop. Johns also makes himself available as a confidant. He seeks out those who appear to be troubled and takes the opportunity to speak with them privately. This allows them the chance to share their anxieties with a sympathetic audience. Beneath the surface, though, Johns is a bully who is very skilled at manipulation. Johns likes to make himself a crutch for the authority figures around him, as he did with Fry initially in covering her attempts to ditch the passengers. He used the same basic trick in portraying Riddick as a boogeyman that only Johns could stop. When Johns starts to lose his ability to influence others, as when Fry saw through him and started to ignore his advice, he becomes hostile. John will belittle them and undermine their authority, letting his true colors show. Johns is also quick with excuses for his weaknesses or poor behavior. For example, when Fry confronted Johns about his morphine addiction, Johns told her that it helped him deal with the pain from the piece of Riddick’s shiv left in his back after their first confrontation long ago. Likewise, when Fry confronted Johns about having let an injured person die in great pain when Johns had a several-months supply of morphine, he shrugged it off as not mattering. Because said person was going to die quickly either way. Johns enjoys being a marshal because the status allows him to indulge his thuggish behavior without censure or fear of retribution. He’s careful to maintain his image as a “good cop” to keep people on his side. For this reason, he usually omits to mention that his job as a marshal is basically that of a bounty hunter, which is less prestigious. Johns works alone. In this way, any wrongdoing on his part is less likely to be witnessed. He also prefers hunting dangerous felons because the authorities are more likely to overlook excessive use of force in the course of their capture. Johns sometimes goes by the name “William the Conqueror”. This sounds like a typical tough cop moniker, though anyone who knows him well realizes that it also betrays his self-aggrandizing attitude. That same egotism compels Johns to keep logs of his pursuits, alternately emphasizing how dangerous his bounties are and how much smarter than them he is. In very private moments Johns will express some very cynical philosophies about the way the world works. In his view the law is ultimately about commerce, not justice. He’s not bringing in the bad guys to protect the citizenry and punish evil, he’s doing it to keep the flow of business running smoothly. Johns considers notions of good and evil, of light and dark, to be a cop-out; you simply do what you have to to survive. 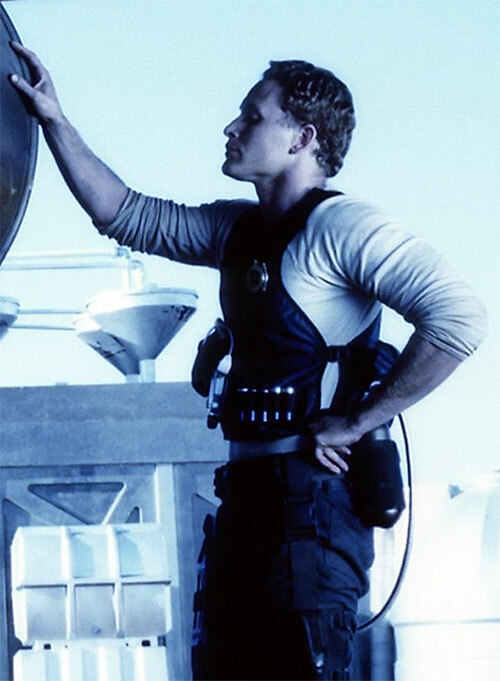 Johns can be used as a bounty hunter or police officer (civilian or military) in any setting. Particularly if the GM needs a character in that position with a hidden dark side or simply a congenial yet boorish law enforcement figure. He’ll most likely work his way into the PCs’ confidences, perhaps even looking the other way at times so that they know they can trust him… which also gives him leverage on them. Credentials (United Systems Marshalls, Low), Iron Nerves, Lightning Reflexes, Scholar (Locating fugitives). Law enforcement agencies (Low), Penal system (Low), Mercenary Underworld (Low). CIA and Loss Vulnerability, all related to Johns’ morphine addiction. If Johns doesn’t shoot up every eight hours (13 APs), he suffers a +1CS penalty to the OV of all actions until he gets a dose. BALLISTIC VEST [BODY 05, Skin Armor: 01, Limitation: Skin Armor can be avoided with a -1CS Trick Shot, Cost: 45]. Pistol-Grip Shotgun [BODY 04, Shotgun blast (Range: 03): 05, Ammo: 05, R#02, Drawback: Long Reload Time]. Pistol [BODY 04, Projectile weapons: 04, EV 03, Ammo: 11, R#02. This long barreled automatic pistol has a leather hand guard strap with two rows of spikes, letting it serve as a makeshift melee weapon as well (EV)]. Tactical baton [BODY 04, EV 04 (05 w/ STR), Limitation: EV is Non-Lethal, Cost: 10. This is a collapsible steel club. A quick snap of the wrist will extend the sections of the club from the handle]. Knife [BODY 06, EV 03 (04 w/STR, 06 w/ MA), Cost: 17. Johns’s badge was actually the handle of short dagger. He would slide the dagger into a small sheath sewn into the left breast of his shirt or flak jacket, leaving the badge/handle sticking out]. Johns usually carries enough morphine to last him a month; the syrettes are hidden in red shotgun shells with the rest of his ammo (which is in blue shells). Source of Character: Escape From Butcher Bay (Xbox game), Pitch Black — Unrated Director’s Cut (DVD). Helper(s): Official Pitch Black website, the Sci-Fi Channel’s Into Pitch Black website .